Bullet of Abandoned Florida shares interior images from the remains of Springfield's Jacksonville Jewish Center. The northeast corner of West 3rd and Silver Streets serves as a silent example of Springfield’s rise, fall and rebirth. Currently a place where weeds congregate today, 90 years ago it opened as the shining masterpiece of Jacksonville’s Orthodox Jewish community. With Springfield booming in growth and becoming the epicenter of the city’s Jewish community, this spacious site overlooking Springfield Park and the downtown Jacksonville skyline was acquired by Congregation B’nai Isreal. Chartered in 1905, B’nai Isreal had outgrown their 18-year-old Synagogue located in LaVilla at Duval and Jefferson Streets. Upon completion of the new two-story sanctuary, the Congregation B’nai Israel assumed a new identity for itself as the Jacksonville Jewish Center. As Springfield continued to expand, so did the Jacksonville Jewish Center. Expanding over the years to meet the needs of the growing congregation, by 1959, the religious campus included a chapel, library, social hall, school, playground, auditorium/gymnasium, banquet facility, bridal lounge, meeting rooms and offices. Like many established urban communities of the era, Springfield began to decline after the end of World War II. Once home to the city’s premier commercial corridor (Main Street), life was siphoned out of the neighborhood with the completion of the Jacksonville Expressway (I-95), the 20th Street/Haines Street Expressway (MLK Jr. Parkway), the opening of suburban shopping centers and public policies that fueled growth on the outskirts of the city, at the expense of the urban core. Seeking larger and greener pastures, the Jacksonville Jewish Center purchased land in Mandarin before the end of 1963. Periodically expanding their Mandarin campus over the next decade, the incremental relocation from Springfield was completed when Center dignitaries carried Torah scrolls from the ark at Third and Silver to their new home on San Jose Boulevard on Sunday, January 11, 1976. 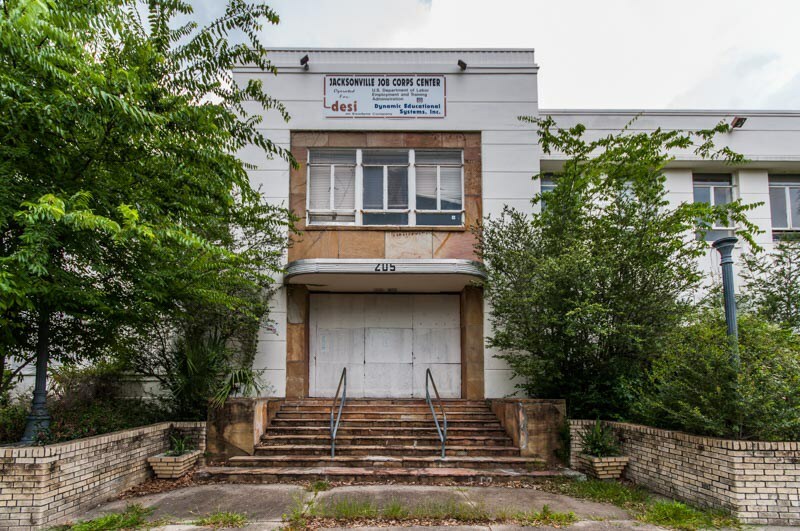 Three years after the Jewish Center relocated to Mandarin, the Labor Department acquired the property for $400,000, opening it as the Jacksonville Job Corps Center in 1979 to train and educate high school dropouts. The Corps operated at this site for 26 years, before moving to a new home in 2005. Following this, the General Services Administration, the division of the federal goverment that deals with real estate and property, attempted to work with River Region Human Services to convert the property into an adult drug rehabilitation center. Due to heavy scrutiny by the City of Jacksonville and Springfield residents, this proposed project eventually died. Over the next few years, proposals materialized to redevelop the property as additional museum space, lofts and limited retail/sidewalk dining facing Klutho Park. Unfortunately, bad economic conditions would delay this dream and a devastating fire on April 25, 2011 would forever end the idea of breathing life back into the property’s 1927 sanctuary. 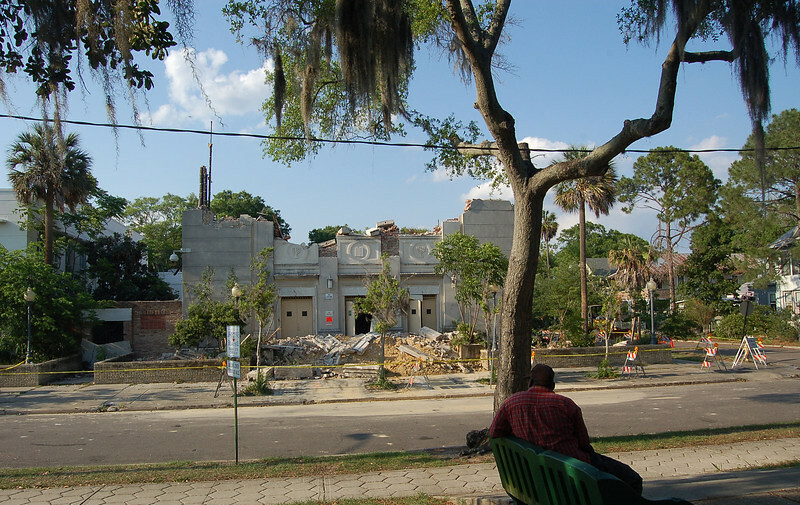 With the sanctuary lost forever, the remaining Jacksonville Jewish Center buildings have stood standing tall in silence for six years. However, hope may not be lost. The rebirth of Springfield has led to the possibility of the Jacksonville Jewish Center site being activated once again. Tampa-based GNP Development Partners, LLC. intends to transform the 2.13-acre property into a mixed-use multi-family development called Springfield Lofts. Acquiring the property for $100,000 in 2016, GNP plans to re-use the remaining buildings once occupied by the Jacksonville Jewish Center. 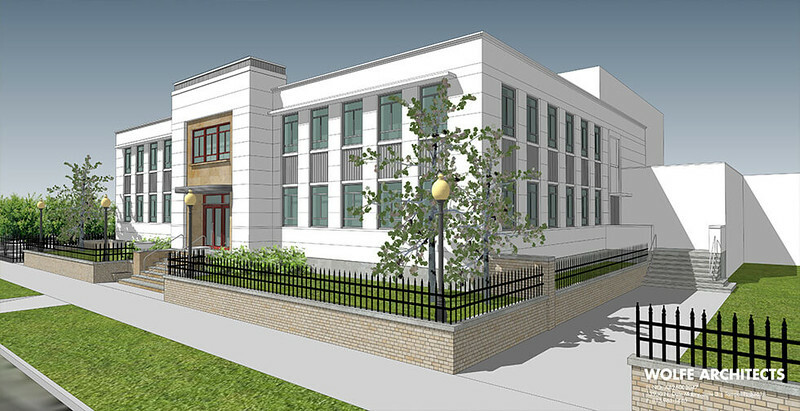 The largest involves the adaptive reuse of an existing 40,300-square-foot building into 34 residential units and 5,400-square-feet of ground floor commercial space overlooking Klutho Park. 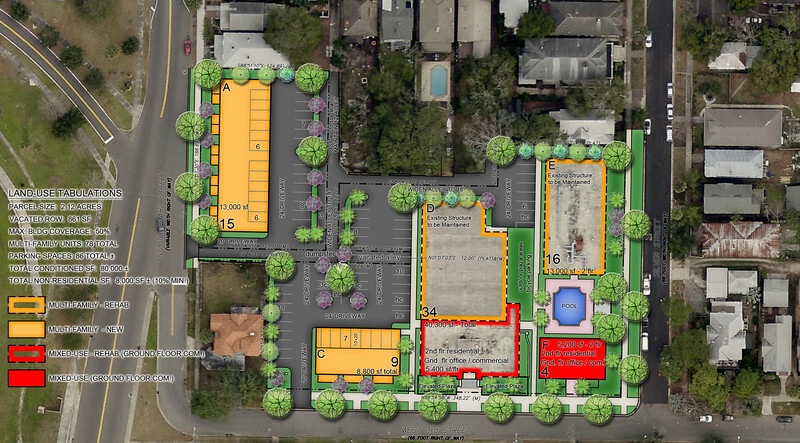 A second structure, originally a dormitory facing Silver Street, will be converted into 16 multi-family housing units. In addition, the redevelopment project will three new construction buildings along Pearl, Third and Silver Streets, housing 28 residential units, along with some street level retail. Proposed outdoor amenities include plaza areas, pavilions, kitchen and swimming pool. 86 on-site parking spaces will be situated in the rear of the property. Once the project breaks ground, construction is anticipated to take 12 to 24 months. In the meantime, the remains of Springfield’s Jacksonville Jewish Center lay quietly waiting for their moment to once again serve as a neighborhood beacon and destination point.